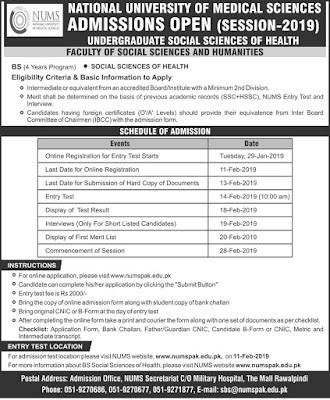 National University of Medical Sciences (NUMS), Rawalpindi has started admissions for a new Undergraduate Program in Social Sciences of Health. The Program is being offered by the Department of Social and Behavioural Sciences. BS Social Sciences of Health is a multidisciplinary Program that focuses on health-related issues using the analytical lenses offered by Social and Behavioural Sciences. The Program gives understanding, develops insight and helps the students to conceptualize social, cultural, environmental, political, behavioural and economic conditions that affect the health and wellbeing of wider communities. Minimum 50% marks in Intermediate or equivalent (2nd Division). Must have appeared in NUMS Entry Test. Eligible candidates can apply online from the link given below. Create a new account by entering the details. After creating your account fill the form with correct details. Application Form and Challan will be generated after you complete all the required details. 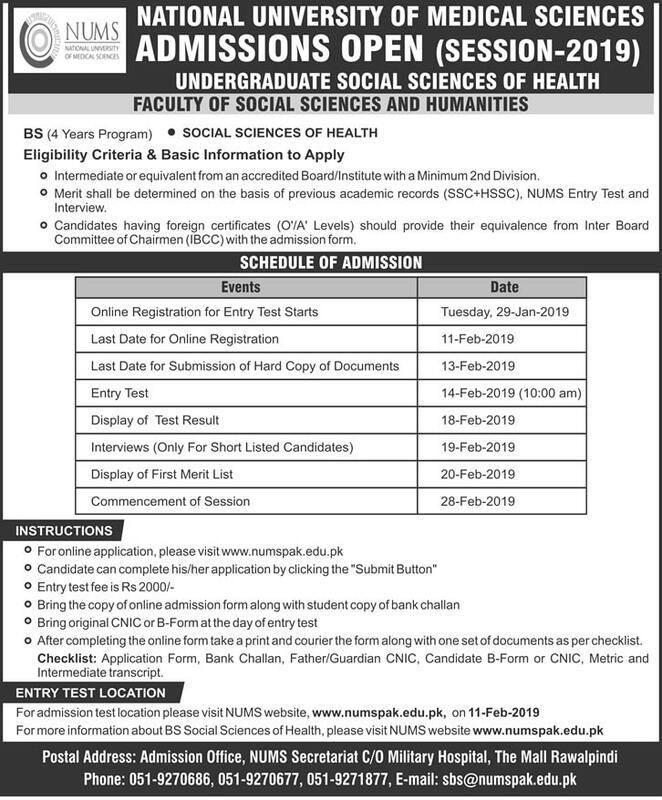 Send the application form with all the required documents to NUMS Secretariat.